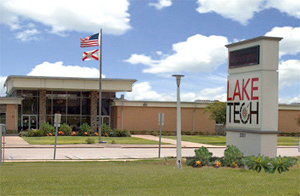 The Lake Technical College (Lake Tech) main campus is located in central Florida at 2001 Kurt Street, Eustis, Florida 32726, 352-589-2250, and was known for many years as Lake County Area Vocational Technical Center. Lake Tech’s extension campus, the Institute of Public Safety (IPS), is located at 1565 Lane Park Cutoff, Tavares, Florida 32778, 352-742-6463. Although not adjacent, the IPS firing and driving range is located in close proximity to IPS at 13000 Frankie’s Road, Tavares, Florida 32778. Lake Tech is a public, postsecondary educational institution as defined by Florida State Statute 1000.04(2). Currently, Lake Tech offers 28 postsecondary certificate programs. Lake Tech services cities, towns and communities in Lake County including Tavares, Eustis, Mount Dora, Leesburg, Fruitland Park, Clermont, Minneola, Groveland, Mascotte, Lady Lake, Umatilla, Dona Vista, Montverde, Howey-in-the-Hills, Paisley, Sorrento, Mount Plymouth, Astatula, Altoona, Lake Jem, Astor, Yalaha and Okahumpka. Students from other areas of the state and nation, as well as international students, are also served.